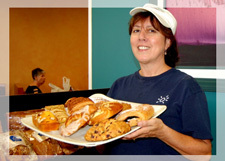 Daniel and Linda Freedman opened Blue Moon Bagel Cafe in 1996, but their experience dates back more than 35 years. Prior to Blue Moon’s opening, they ran Freedman’s Bakery of Brookline and Boston, including five retail stores and a large wholesale business. At Blue Moon, Dan and Linda have created a community meeting place, complete with booths, couches, and an abundant sample of fresh baked goods. 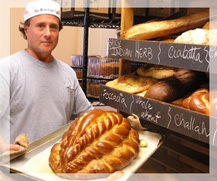 Daniel Freedman, owner/baker of Blue Moon Bagel Café and a 4th generation master baker, began his career at age 11 in the family business. At Green Freedman’s on Harrison Avenue in Boston, he worked with some of the area’s top Eastern European bakers. Freedman attended baking school at the prestigious Dunwoody Institute of Minneapolis where he graduated with honors. He also completed the master’s course in baking technique from the San Francisco School of Sourdough Baking. Freedman went on to start the award-winning Freedman’s Bakery of Brookline and Boston. At the time, Freedman’s of Boston, located in Quincy Market, was the highest grossing store (per square foot) in the US. Almost 30 years ago, Linda Freedman first began working in the bakery business, managing the successful Freedman’s Bakery in Quincy Market. 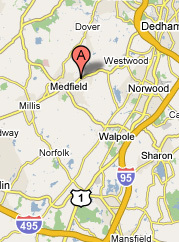 Later attending Lesley College, Linda earned her Master’s degree in Counseling and Psychology. A trained psychotherapist, Linda uses her skills with people to oversee the store and its culture. She supervises and runs the front-end of Blue Moon, ensuring the satisfaction of all of the bakery’s customers.